European truck makers have fairly succeeded in bringing down the CO2 emissions via vehicle technologies, along with significant reduction in pollutant levels as well. But then, it is not just the new vehicles that contribute to the emissions, as they constitute only 10% of the total running fleet. Therefore, an ‘integrated approach’ involving various factors and stakeholders, not just the new vehicles, has to be formulated so as to achieve ambitious emission reductions in future. The European Automobile Manufacturers’ Association (ACEA) is actively proposing additional and alternative approaches and ideas to realise full potential of further reducing CO2 emissions, which could make Europe to more than double annual CO2 reduction from road transport. The general perception is that trucks are more ‘dirty’ in terms of carbon emissions, but the statistics say that only 5% of all greenhouse gas emissions in Europe are attributed to them. Yet, they take care of 75% of all land-based cargo transportations, including day-to-day essential supplies like food products and others. In addition, the fuel consumption (along with the CO2 emissions) of the European trucks have come down considerably in since 1965, up to 60%. In terms of pollutant emissions, the levels of nitrogen oxides have come down by 95%, while the particulate content have dropped by up to 98% in the since 1990. Video: How to double the annual CO2 reduction rate? Thanks to fuel-efficient technologies such as common-rail diesel injection, turbo-charging, improved aerodynamics, and automated-manual transmissions (AMT), a modern truck in Europe can transport 1 tonne of goods for a distance of 100 kms with just 1 litre of fuel (hard to believe though!). However, such ‘green’ technologies predominantly focuses on new vehicles that constitute that 10% of the total operational fleet, while the remaining 90% of the fleet are ignored. This fallacy in the ‘new vehicles only approach’ to reducing CO2 emissions has to be overcome, so as to achieve ambitious reduction targets and reduce environmental impacts out of road transport in future. 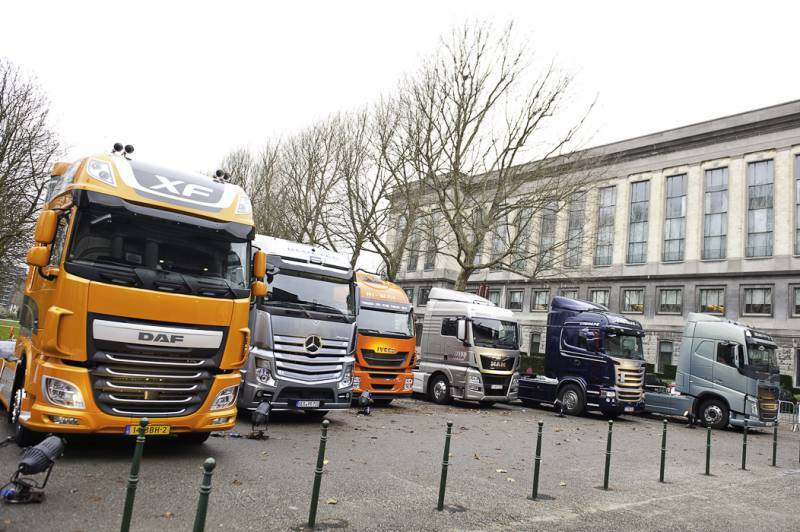 ACEA’s members includes all major European truck makers like DAF, Daimler Trucks, Iveco, MAN, Scania, and Volvo group. Moreover, there are numerous other factors (than just the vehicle) contribute to CO2 emissions from cargo transport. For instance, the vehicle length and weight, trailer designs, optimised transport operations, driver behaviour, alternative fuels, infrastructure, etc. are also key to achieving efficiency. Therefore, the industry groups such as the ACEA calls for an ‘integrated approach’ that take into considerations a wide array of measures and stakeholders, along with industry’s continuous development in vehicle technologies, to combat carbon emissions more effectively. Truck makers are now showing interest on holistic ideas such as low-rolling resistance tyres that can be retro-fitted on any trucks, efficient trailer combinations, intelligent transport systems such as truck platooning, renewable fuels like bio-diesel and HVO (Hydro-treated Vegetable Oil), driver training for fuel-efficient driving, and improved road infrastructure. This shift in approach a significant step towards combating emissions and achieving ambitious reduction targets in the future. Although the European legal norms on CO2 emissions are still based only on the vehicle technologies, the industry standards group such as the ACEA (whose members include all of the large CV makers in Europe) is actively pursuing integrated and holistic measures to realise large reductions in emissions on their own without much of the legal persuasion, which is a welcoming sign. Next, would you like to read more on Trucks, Buses, or Commercial Vehicles ? ?